Tyrone:	'The first one was when I arrived in L.A. , it was on Tuesday September the 22 1972 at 10h22pm, it was milestone in my life. 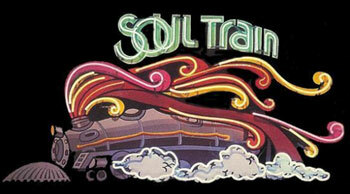 As soon as I arrived I was immediately become friends with the Soul Train gang. I met Little Jo Chism who took me to all the clubs and to the Paradise Ballroom in L.A. where I first saw "Posing" dancing. The second high light of my life was to have the chance to enter Soul Train as a dancer the same year and also to tour with Don Cornelius and the Soul Train gang with famous groups such as Eddie Kendricks, The 'Whispers and the Monents'. I would like to say that thanks to Soul Train because many dance styles came out to public such as Locking, Popping and Waacking and all this was made popular from this one show. The dance moves of John Travolta in Saturday Night fever were directly taken from the Soul Train Show (Locking and Waacking). Another highlight of my life as dancer was to be meet Sharon Hill as my dancing partner we won a national contests dancing together. Also another highlight was to be able to travel to Japan with the 'Outrageous Waack Dancers' including Tammy, Cleveland Moses, Kirtland Washington, Sherry Green and myself. At this time only I think only "The Lockers" and a group called "Something Special" had been there. My other following great experience was to go to New York and to be part of a group called "Breed of Motion" which was the first "Waacking" singing group including the late great Willie Ninja. After that, Jodie Watley called me in N.Y asking me to do the music video in Paris called 'Still a Thrill' and that was actually the first music video ever to incorporate "Waacking". Then from there I had the opportunity to choreograph another music video from Taylor Dane 'Tell It To My Heart' which is the first video ever to have Voguing in it (1987). Tyrone: 'The were auditions in a recreation center in L.A on a Saturday. The teen coordinator at this time was called Pam Brown, she would come with Don Cornellius (the Creator and Host) a week before the TV show and would pick up some dancers passing through a Soul Train line set up for the audition. The people who were selected would be listed on the TV studio's guest list. If your name was not on the list you couldn't get into the dance studio. We taped the show one weekend a month they would tape 2 shows on the Saturday and 2 on Sunday. 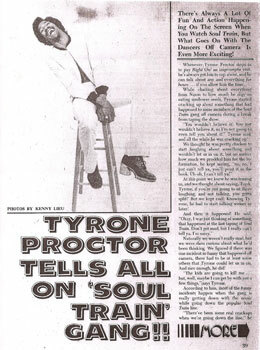 Tyrone: 'This is actually Don Cornelius from Soul Train who called me 'The Bone' because I was very thin at this time. Tyrone: 'The first was Posing, I still remember them playing the track "Papa was a rolling Stone", on each 'boom' of the track the dancers were doing a different Pose, you could see all these dancers on Posing, this was phenomenal, then Waacking then Voguing. They all have a common point, they come from the gay community. On the straight community you would have the Funk and Soul which evolving to the Hip Hop meanwhile on the gay community you would have Waacking with Disco that was popularised in the early 70s it also evolving to Voguing with House Music the early 80s. Both styles had sylables that were seen in the gay community before they were set as dance forms. The big differente between Disco and House is the BPM (Beat Per Minute) is that Disco was a lot faster (aprox. 127-145bpm) than House (aprox. 112-121bpm) and also the content is different, in the Disco you have a lot of hornes and violins and other instruments that you interprete with the dance. Voguing is more concentrating, more competitive, angular and a less emotional. Voguing was popularised through the medium of Super Models such as Iman, Beverly Johnson, Janet Dickinson , Grace Jones, Pat Cleveland, you had all these girls that would be on a runaway walking up and down.The gay community would emulate that on the street, pretending to be these super models. The Egyptian culture had a big influence on vogueing. Also remember of Willie Ninja that was watching a lot of Kung Fu movies and would apply some of the moves in his Vogue style of dancing. Tyrone: 'It's actually Jeffrey Daniels who initially told me that I should start teaching Waacking when he was in Osaka Japan in 1991. 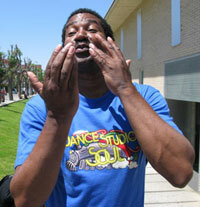 Then Brian Green kept asking me to teach Waacking. I was reluctant but he insisted so I started doing it. I am one of the last of the living pioneers and with the Resurgence of Waacking. I am extremely lucky and honoured to have met in my lifetime some of the greatest dancers in human history. Tyrone: 'I appreciate that, but I can't take credit for it. It's very difficult say who created Waacking because it came from different minds and it was a variation of different styles. I put a name 'Waack' so people could understand the movement. My part is to secure dancers such as Lamont Peterson, Blinky, Micky, Andrew Frank, David Vincent, Arthur, Tinker, John Pickett, Gary Keys, Dewayne Hargrave, Billy Goodson, Billy Starr, Lonnie (gymnastics), Abe Clark, Michael Angelo and many, many more, because many are no longer with us. Tyrone:I always tell people that they need to follow their dream because their dream should set them free. Aus, Shake, Eva, they are like my babies, I love you guys! Just keep growing what you're doing! Thank you for this interview Tyrone, it's been a pleasure to meet you!